A Complete Website Marketing Game Changer! YLDist.com now offers a stunning LEAD CAPTURE along with a very high-quality PRE-WRITTEN Email Drip Marketing & PRE-WRITTEN (twice-monthly) Newsletter System! This is ALL INCLUDED in your website at NO additional cost for unlimited contacts. Frequently asked questions and answers are at the bottom. This is a robust EMAIL MARKETING feature and contact management that other websites charge a lot of extra money for! Your site has one affordable monthly price, ALL features included (and a lot cheaper when paid quarterly or yearly). EXAMPLE: If one gets a yearly subscription, it will effectively cost less than $10 a month. (for all the features!). This is a huge marketing game changer for you! Imagine, now you can stay in front of your team and new prospects with high-quality emails that are personalized from you to them! #1. — Your LEAD CAPTURE is built right into your website (you will be offering an “ESSENTIAL OILS 101 Email Class”) and once subscribed, the prospect will be automatically sent your default PRE-WRITTEN EMAIL campaign which is high quality, yet silently selling them on reaching out to you to get started. #2. — Email series for your Essential Oil Premium Starter Kit customers is the second pre-written email series that you can manually add a customer to and it will drip email automatically to them. This email sequence will ensure your brand new PSK owner starts using their kit and this series of emails does everything to ensure they stick with it and end up ordering more products. #3. — NEWSLETTERS – These are high quality, interactive, pre-written emailed newsletters that are for your customers/team to keep them up-to-date, excited and informed. They email out twice a month and you can EDIT them as much as you want if you want. WHAT DOES MY LEAD CAPTURE LOOK LIKE? 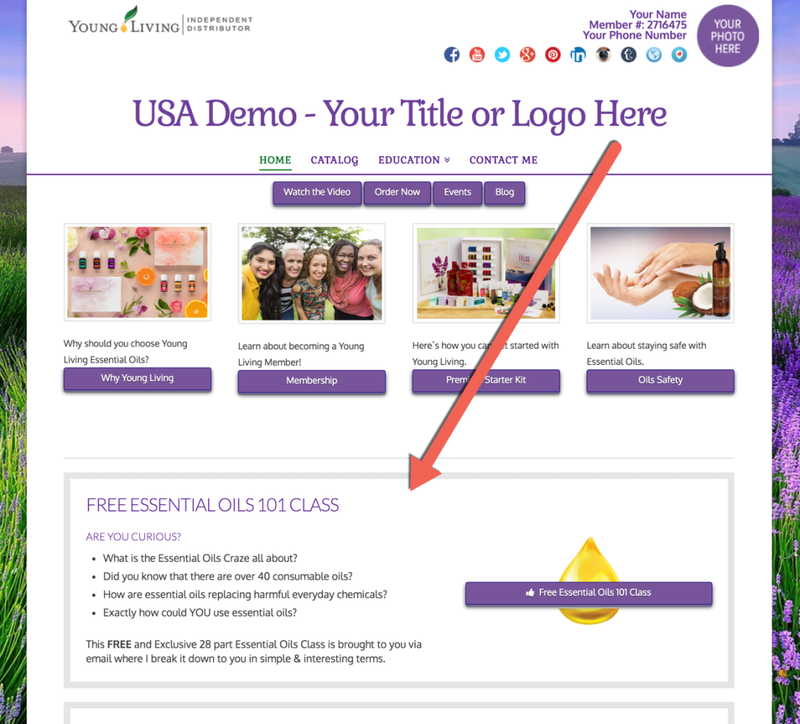 Once your prospect gets to your site they are invited to subscribe to receive an Essential Oils 101 Class, via email. These can be people who come to your site on their own or even someone you tell to go to your site to sign up for the class. Try putting your own name in and start receiving the series. You will also have access on your phone to quickly add someone to the EO 101 Email Class. Everyone has to confirm they want the series and everyone can opt out if they decide they don’t want any more classes or emails. Is all of this COMPLIANT? – Yes, each of these features is compliant for each country, USA, Canada and Australia. Can I EDIT – YES, everything can be edited, even the newsletters, but only if you want. Is there TRAINING? – YES, consisting of videos, photos and a support desk, as needed. Can I upload my CONTACTS? – YES, you can download your team from your VO and upload to your contact system and assign them to the appropriate email series or newsletters. Are they PERSONALIZED to me? – YES, all communications are personalized and appear like you have written it and personalized to the recipient. Can I WRITE MY OWN? – YES, you can write as many additional email series as you like. Can I send ONE EMAIL to my team? – YES, you can write a special EMAIL and send it to all or parts of your contact list. Will you be making more pre-written messages? – YES, over time we will be adding email series that you may like, such as an “Inactive Member” series. It is easy to activate and get started using this new feature if you have a YLDist personal Young Living website. CLICK HERE to find out how. Newsletter – (Members Only) This is a newsletter-styled email that goes out two times a month to those who have subscribed for it. It is only for MEMBERS since we can compliantly say a lot more things to your members to keep them educated, active and buying & trying new fabulous products! Use this for customer retention! And if you’d like, you can learnhow to add to it or edit parts of it before it goes out each time. This is fabulous if you have private TEAM specific news that you would like to add each time, for just your team/customers. Oils Premium Starter Kit Sequence – (Oils PSK Customer Only) This is an email sequence that you assign to your new OILS PSK customers to educate them on each and every product they received in the Oils PSK. It is a fabulously pre-written and informative series that will ensure they have everything they need to know to fully get the essential oils in their kit incorporated into their lives and their loved ones’ lives. Thieves Premium Starter Kit Sequence – (Thieves PSK Customer Only)This is an email sequence that you assign to your new THIEVES PSK customers to educate them on each and every product they received in their Thieves PSK. It seriously helps ensure they have everything they need to know to fully get the benefit of using Thieves products and incorporating them into their lives and their loved ones’ lives. NOTE: If this is all new to you, there are short “how-to” videos in your website’s dashboard. The link is called “Website How-To Videos”.